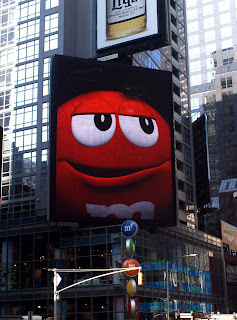 That was my response last month when I learned there was a huge candy store named M&M World smack in the middle of Times Square. I marveled at how this place seemed to take up the entire corner of the block and span at least three floors. I thought, "there's no way there is that much M & M junk for sale." M & M World was filled with more M & M paraphernalia than you could ever imagine. Books, key chains, glasses, mugs, pajamas, underwear, socks, hats, jackets, Tee shirts, shot glasses, pens, pencils, doormats, plates, stationary, combs, ....... on to infinity! Aren't these little guys/gals adorable? Well, I wasn't to be denied. After all, I came there for the chocolate. So I found my way to the dispensers. I was sure to load up on the peanut M&M's (my favorite) and the dark chocolate ones. I threw in a few almond M&M's and mint flavored for kicks. I tried to avoid the green ones just in case what they say about them is true. 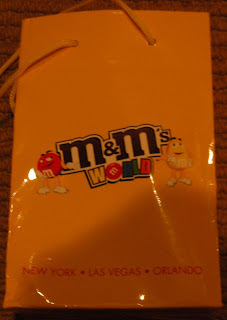 I giggled when the lady next to me seemed to miss her bag and dribbled a barrage of M & M over the lip of the bag. They clinked and wobbled down this little grate and into a hole - disappearing from sight. I couldn't help but wonder.... "What happens to those lost M & M's?" Do they just throw them away? Or do the employees get to eat them at night before they go home? Or maybe someone is responsible for separating them and putting them back in the dispensers for resale.... Yuck! I hope not! I quickly erased that thought from my mind. So I gathered my purchases and bid farewell to the M &M Dudes. I couldn't help but notice another candy store across the street. Chocolate even..... That's another day and another adventure. She referred me to this video for the true meaning of Chocolate! Wow! You mean I could have had a Cadbury? She really knows her chocolate! Stay tuned for more adventures in Candy Land. Oh, my boys would love that store! Peanut M&M's are my favorite as well. You are in SERIOUS trouble Mr I! Just as I was thinking you're a cute guy you compare me to a gorilla! Fortunately, I knew what was coming when I saw the still clip otherwise I may have been beating my chest and stomping on my bananas in fury. Is this what you call getting your own back?! Ps; Don't forget to work out after eating all those M&Ms; the thought of you bulging in your speedos is not good for me. Great choice on the the peanut M&M's. I also enjoyed the peanut butter ones. I'm sure your boys will love it. I see there's one in Vegas and Orlando. Cheers! Ladies and Gentlemen, it is alleged that through the course of my writing I have insulted the lovely and beautiful Jane Turley by comparing her to a chocolate loving ape. I submit that any suggestion from my writing that Miss Jane resembles the ape in the video is purely coincidental and unintended. I am very sensitive to any pain/suffering experienced by Miss Jane as a result of her reading my post. (grovel... grovel) I further acknowledge that sometimes it is better for everyone else when they can laugh at you instead of laughing with you. With that said, I would prefer it if everyone laughs at me and not the funny Miss Jane.. And lastly, I happen to believe that if you look and act like a big fury ape, at least you should be cool and play the drums and have great taste in chocolate! LIVE Long, Listen to great music, and dine on fine Chocolate! Hmmm...not bad for impromptu grovelling. Now sweet talk me some more and I'll let you have some of my Cadburys. Personally, I find nuts particularly tempting! You see Tamera and I like the peanut M & M's. Do you dip your Cadbury chocolate in peanut butter? Peanut butter M&Ms, Ghiradelli chocolate mint drops, and DARK chocolate... These would be the main components of the the chocolate food group (a little side balcony on the food pyramid). 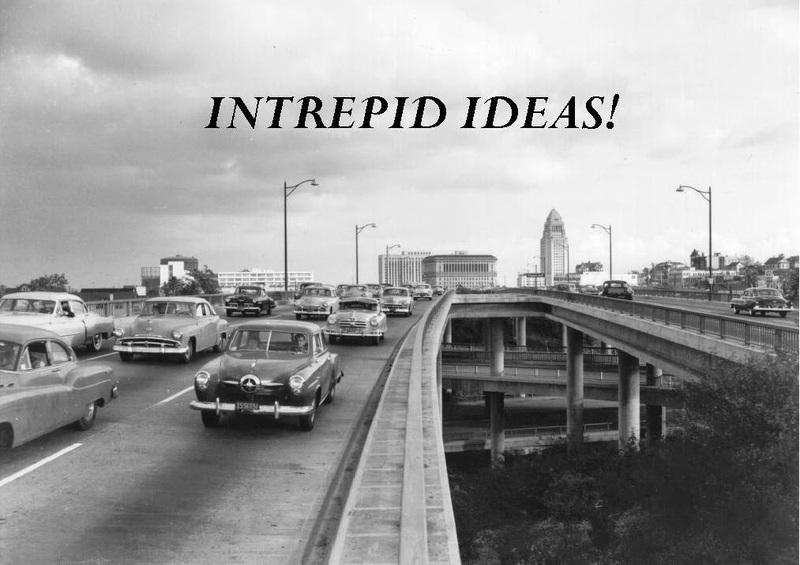 Miss Jane, I believe that Intrepid fully intended to compliment your fine musical abilities. Do not let the gorilla fool you. That was just some heavy duty symbolism wrapped around your "primitive" passions for life and fine chocolates. Red wine and dark chocolate are heavenly together. Gotta get your fruit one way or another! Yes - but you said it so eloquently. I quote you: "heavy duty symbolism wrapped around your "primitive" passions for life and fine chocolates." I'm not so sure I could have come up with something so brilliant on my own. I like the way you're thinking. Especially the fruit thing. Dark Chocolate and Red wine to get our fruit. We'll have to alternate with Champagne and Strawberries. Every third day, we'll have Straberries dipped in chocolate. I DO sound good when you "quote" me! Why don't I send you one of the manuscripts I'm continually working on and you can quote me to a publisher! Well Mr I has reworded his post into something more flattering but those intial words cut me to the quick! Oh how the tears did flow over my poor little forlorn face!But I'm prepared to forgive and forget because ordinarily Mr I is sooo charming and I'm sure would never stoop so low as to imply my facial hair is getting out of control. Between you and me Footsteps my strumming is pretty bad and the last wind instrument I played was after Christmas lunch but if Mr I wants to believe I'm as cool as Phil Collins I'm happy with that. You know I believe Phil Collins wrote that song after Christmas lunch; maybe we do have something in common. Oh, better say Hi to Mr I while I'm here! Good Morrow Mr I! I hope you're saving me some of that champers becuase otherwise I can be a very cross bunny; the facial hair is not so bad but the ears are really, really big. Send away Baby... I'll line you up with an agent! Make it juicy though. Hollywood needs some shaking up. I kinda like the big ears on you. And the drum strokes. Keep it up! But the personality is the best. Passion for the moment rules. What's the best tasting Turkey? Music Monday - Moby, Jill Scott, Blue Man Group! Quantum Of Solace! 007 Is Back! Happy Veterans Day! - Free Stuff for Vets!